Red shoes are the footwear equivalent of red lipstick. We can love the idea of them BUT the reality of styling a pair can leave us scratching our heads. No one wants to look like a clown... or worse (in my opinion) like we're trying to look "fun" (shudder). Red shoes can be a bit tricky for sure! Styling red shoes requires the same confidence (real or faked) as wearing that red lip. Red shoes require a confident strade and a "devil may care" attitude. Red shoe wearing leaves no room for apology. If you love the idea of being bold and sassy then a red shoe is the way to go. Why not go all-in and pair them with a red lip? So the one simple rule when it comes to wearing RED SHOES is to wear them with ATTITUDE. Don't worry about what colours 'go' or the 'right' way to wear them. Stride out and enjoy them! Blue jeans and a plain top. I'm wearing a pair of 80's-style red suede pumps that were kindly gifted to me by Jones the bootmaker (see this pair HERE). Jones the bootmaker is a brand I used to visit years ago, for good quality classic items, but they seemed to drop off my shoedar! So when they got in touch to let me know about their recent revamp I was happy to revisit them! The shoes still have the reliable quality and classic vibe but they're nodding a little more towards trends, which is nice to see. Style AND comfort is what we're all looking for, isn't it? These red courts are comfortable, thanks to the block heel and the supportive insole. Perfect for one of those events where you know you're going to be on your feet a lot! Do they make you feel more confident? Or, do you find them hard to style? I love to read your blog on a Sunday morning, when I don't have to rush off anywhere! 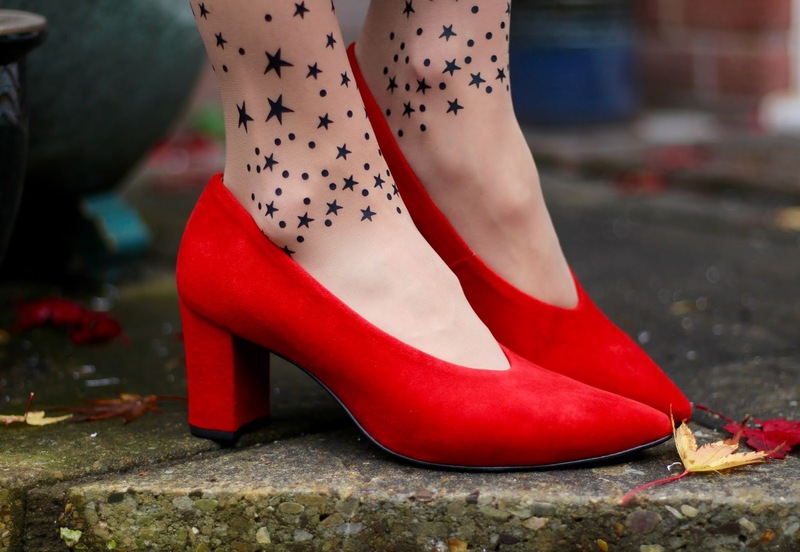 Loving your red shoes, Samantha, especially when paired with those fabulous tights; very evocative of Dorothy they are! Although the heel is too high for me, (two inches is my max) I've been looking for a pair of low booties with that leg lengthening vamp your shoes have. Very fetching! I don't have any red shoes, so I don't worry about styling them. I did, however, just receive a pair of burgundy booties, that I totally love, and plan to style those with my jeans and a leopard print long sleeved top, along with my burgundy cardigan. I am so excited about my burgundy boots! Thanks for the inspiration! Your burgundy boots sound fabulous and you'll be surprised how neutral they seem when you start wearing them. Burgundy works with just about anything!! You look particularly Fabulous in this stunning outfit and I love your dress with the interesting pleats and shape! and love how the dusty color is enhanced by the red details. And your tights are so amazing! As I'm concerned, a girl can't have many red shoes (or tights, or dresses!). I'm a huge fan!! My favorite combo is red shoes with red tights, creating a color column. I love red with turquoise, grey, teal, black and even orange or pink! Red and teal is one of my favourite combinations Monica... and pink!!! YOU are the queen of colour matching/clashing and I'm not at all surprised you have more than one pair of red shoes!! 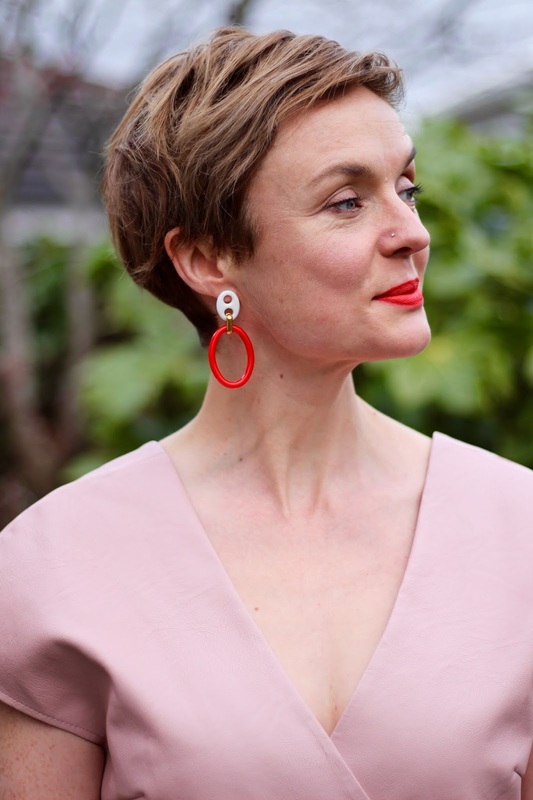 I'm a red shoe junkie - I love a pop of red, and I think that they are essential as a shoe wardrobe basic. They jazz up any look, and go with any colour. Loving these high-vamp ones (especially with those star tights! Wow! ), and how nicely they go with this blush pink, Samantha! Glad you went with the red lippy too! I love a "bookend" look. Thank you so much Sheila! Have you noticed that out in our day to day worlds there are very few red shoe wearers? We see them on blogs (and in the mirror!!!) but they're very few and far between out there in real life. Hopefully our red feet with spread a little joy and maybe inspire someone else to slip into a pair of ruby slippers?! Totally! I think our ATTITUDE is important for any item that takes us out of our comfort zone. If you think you are (fill in the blank), you ARE! Any time we fill adventurous we need to make sure our attitude is one of CONFIDENCE. Heck, we could all wear paper bags if we had the attitude of confidence. Right?! I love pink and red together--such a beautiful combo. You look STUNNING! I am all about fancy tights and I love these of course! The pink and red are a great mix. Love the pointed red pumps, and other touches of red- lip and earrings. Great look!